Smartphones and tablets now make great portable recording studios, thanks to powerful processors and a plethora of high quality apps. The weak chain in the process is that of sound capture. The standard microphones built in to this hardware just isn’t designed for high quality capture. This is where an additional audio hardware unit comes into play, but many units are bulky, or they require a power source which is either the phone/tablet itself, or AC power. This can reduce portability and severely impact working time due to fast battery drain. Enter MixerFace, a portable pro-quality audio recording hardware unit based on the same design as the popular and highly-regarded HiFi-M8 audiophile-quality D/A converter/headphone amp. Two custom, discrete, boutique microphone preamps, based on our new, low-noise dbpre technology. 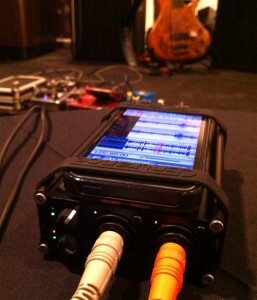 Each input features a Neutrik combo XLR jack with mic / line inputs and a wide-range gain control. Inputs can accommodate keyboards, guitar pedals, as well as and other XLR or 1/4″ audio sources. Works with old 30-pin iPhones/iPads and new lightning connector-based iPhonesiPads. You can use the white charging cable that came with the iPhone. We will also offer shorter cable options. Android devices also supported. Check out the Indiegogo campaign to raise funds to get this into production.